New Year’s Eve and New Year’s Day … the Kindle version of THE FEVER is FREE! Take a walk in Sam’s dusty boots and catch THE FEVER! A riddle, an obsession, and a quest … what could possibly go wrong? Don’t have a Kindle? Get the free Kindle app and start reading on your phone. It’s only free for two days … get it NOW! Take a chance … Catch THE FEVER this holiday season. Click below for your chance to win one copy of The Fever. Good Luck! Oh, and have a joyous holiday season. If we were having coffee today I would no doubt be complaining about Daylight Savings Time. Yes, I hate it. I mostly hate it for a week or so when the clocks go forward. After that things sort of settle out. My feelings, though, go more toward why is it even necessary? I don’t buy most of the arguments. I frankly don’t see where it saves energy in this day and age. What it mostly does, is give people more play time in the evening. And since there is still the same amount of daylight no matter how you slice it, gradually increasing until the Summer Solstice, then decreasing until the Winter Solstice, all in all, I guess it doesn’t much matter. I still have three favorite observations about DST. One, the popular slogan is invalid. Spring Forward and Fall Back sounds fine enough, but it has always seemed to me to be backward — it doesn’t make practical sense. If I fall, I almost invariably fall forward, or at least to the side. Ah, but if something startles me, I’m entirely likely to spring back. You see? The other two observation have to do with the intent and the implications. I understand the concept of “who needs sunlight at 5AM?”. Sadly, we can’t change the way days progress. What DST switches show us is the true arbitrary nature of time. It’s arbitrary! Admit it. For all our dependence on it, we are dependent on something totally arbitrary. So, to my way of thinking, when it was arbitrarily set up originally, it was made just a bit askew. More on this after I make the second observation. In the US, “STANDARD TIME” is now barely over four months of the year. MOST of the year is that special designation of Daylight Savings Time. What the heck? How is that “Standard?” And people wonder why the aliens are so hesitant to make contact with us. So my arbitrary solution is this: Let’s just choose to buck up and change to a new standard time in the fall … Fall Back (ugh) not an hour, but a half-hour. And then just leave it there. We’ll sort of have the best of both worlds. It is probably how it should have been set up in the first place. It’s not as crazy as you might think … there are half hour time zones in some areas and the world goes on. In more important matters, we’re likely to have another cup while I mention the cookbook I told you about a few weeks back. I have a pretty good version of it available NOW, free for the asking. Just send an email to mossbackinn@yahoo.com and tell me what version you need, mobi (for Kindle), epub (for Nook, Kobo, or iBooks), or pdf (for everything, really, including downloading it and reading it at work). It’s really a load of fun, a companion book to my two novels, full of Tex-Mex and Southwestern dishes and some just down home good comfort food too. Like I said, it’s FREE! “Smidgeon Toll” is a character in both books and by character, I mean she IS a character. You’ll like her. If we were having coffee today, I’d suggest you enter my Halloween Giveaway. Well, I’d explain, I just finished yet another lackluster Amazon giveaway. They are easy to set up, Amazon handles it all, but I’ve had mixed results with them. Sure, I’ve picked up twitter followers with some, have had a lot of entrants, but none of them have attracted as much attention as I’d hoped. The way the Amazon giveaways work is that you buy the prizes up front and they take it from there. It’s a lazy-man’s giveaway. “Oh, a perfect fit for you,” you might say . Right. I had an extra copy left over … from the last giveaway. They give you the option of running another giveaway or getting a gift code for that copy. So, I decided this time, to get the gift code. And here we are. I have this gift code for a kindle copy of my latest novel, A CURSE THAT BITES DEEP. Either comment here on the blog or on my web page (blog or web page comments only) indicate that you are interested in this Halloween giveaway … I’ll draw from the entries early on November 1. I’ll announce the winner on the blog. Feel free to reblog or share. 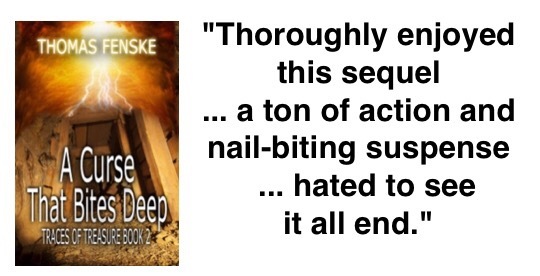 ﻿I’ve started another Amazon Giveaway … three Kindle copies of A CURSE THAT BITES DEEP are up for grabs by a random drawing. No requirements … just enter. At long last, my second novel, A Curse That Bites Deep has been published. To help celebrate the release, I’m giving away several kindle copies through Amazon. Ah, as with most things associated with a curse, there’s a catch. Follow me on Twitter. Not a big deal, the giveaway will guide you. If you happen to win, please favor me with a review. If you don’t happen to win, hey, you can still be bitten by the curse, and $3.99 is not really that much … it’s likely cheaper than a latte. Isn’t It Time You WON Something? This is just a friendly reminder that there are still TWO COPIES (Kindle version) of my novel, THE FEVER up for grabs on an Amazon Giveaway. No purchase necessary, just go and enter for a chance to win. What’s The Fever? I’m glad you asked. What if someone told you how to find a lost gold mine? THE FEVER is about Sam Milton, and that’s exactly what happened to him. Now he is obsessed with finding it and it hasn’t been easy. Time, money, skepticism … he deals with all these things and, in the process, he’s lost friends, lost love, and begins to question his own sanity. Still he goes out … again and again, trespassing, risking his life, and his freedom … for what? He doesn’t know anything except the raw urging that tugs at his soul, driving him to continue. Click below to enter the giveaway … it takes just a second … and you don’t need a kindle to enter. Amazon has a kindle app for just about any device. Open up your world!